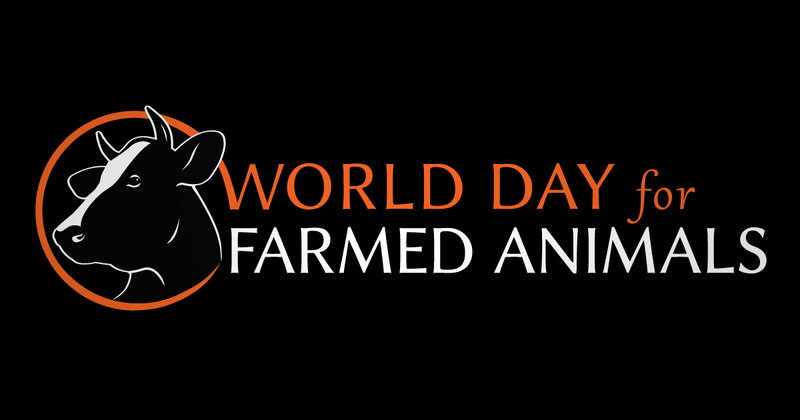 October 2nd is World Day for Farmed Animals (WDFA), and like many of you, I will be spending part of my day demonstrating. 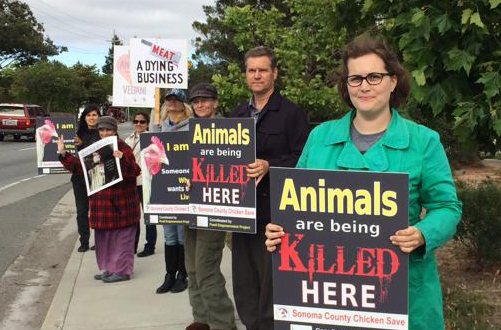 I will be standing outside the Petaluma Poultry slaughterhouse near my home, reminding motorists and other passersby that 50,000 chickens are killed each day at this facility. This all-day event is organized by Food Empowerment Project, but there will be countless other ways you can get involved with WDFA, an international day of action founded in 1983 by the nonprofit Farm Animal Rights Movement (FARM). WDFA is meant to help people make dietary choices that are more aligned with their values and to show animal agribusiness that the tide is turning away from animal consumption and toward more compassionate, healthy living. Worldwide, some 65 billion land animals are raised and killed for meat, eggs, and dairy products every year. Most of these animals are raised in factory farms, where they endure confinement, mutilations, and are bred to grow so large so fast that many of them literally suffer to death before they even make it to slaughter. Even animals raised on small family farms experience many of these abuses. Reach Out and Educate Be a part of a massive outreach effort and distribute literature in your community about animal agriculture. Join the Movement Search FARM’s Event Directory to find an event near you and add your voice to the thousands. Plan Your Demonstration Learn how to take action for World Day for Farmed Animals and organize your own event. Pledge to #FastAgainstSlaughter Join thousands around the world in a day-long fast in solidarity with farmed animals. Watch and Learn Learn about animal agriculture in the 10 Billion Lives video and show your family and friends. Share on Social Media Choose from a variety of graphics to post on your social media and share your message about WDFA. I hope you’ll join me in speaking out for farmed animals!